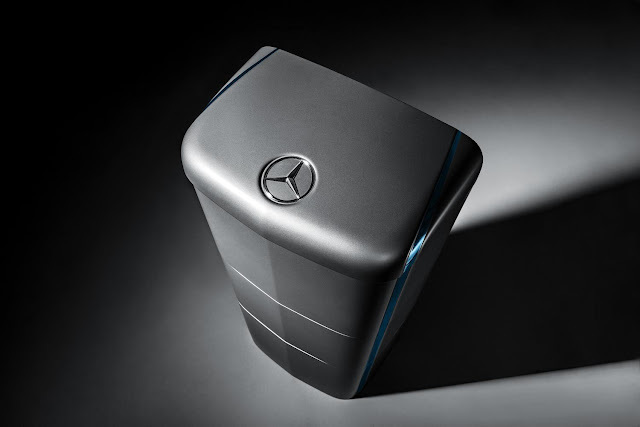 Based on technology used by Daimler since 2012, Mercedes-Benz are set to deliver the first energy storage units to UK homeowners for residential use. Developed to meet the rigorous demands of running a car, the Mercedes-Benz energy storage units are lithium-ion batteries and meet all safety and quality standards. The batteries are 2.5 kWh each, with up to eight modules being combined to form a capacity of 20 kWh with industrial applications having even greater scalability. Households that have their own solar energy systems can use the storage units to store surplus power with virtually no loss. Combining the Mercedes battery storage unit with renewable energy sources means that households can increase their consumption of self-generated energy by as much as 65%. Said Marc Thomas, Managing Director of Mercedes-Benz Energy. At present, Mercedes-Benz Energy is working in the UK with distributors such as Alternergy, Innasol and Wind & Sun, as well as with partners who offer a complete system installation, such as Solar Frontier. Home retail price for home electricity generation is calculated based on a customised package of components. These generally consist of a photovoltaic (solar) system, a battery inverter, an energy management system and the Mercedes-Benz energy storage unit itself, plus the cost of installation. A network of qualified partners and distributors makes planning and installation easy. The latter’s network of qualified installers can advise customers on-site, make offers on all components and manage all planning and installation. Stationary battery storage systems are generally installed together with solar panels. UK sales is the latest step forward for Mercedes-Benz Energy, following the successful market introduction of energy storage products, the start of large-scale industrial projects in the primary reserve market, and the founding of Mercedes-Benz Energy Americas. Customers can find out more about having a Mercedes-Benz energy storage system in their home and find local installers at www.mercedes-benz-energy.com.